The Danish Energy Agency Energistyrelsen, which monitors and supports development in the energy and supply sectors in the country, has updated its overview of installed wind turbines on land and at sea to include 2017, thus giving a full 4 decades of data. 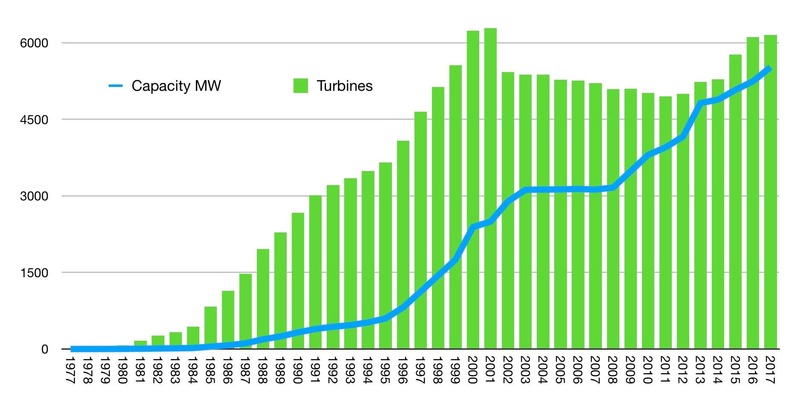 It is rather interesting to see how the number of turbines vs the capacity evolves over the years. Denmark has a long tradition of wind power, which means a lot of old-tech turbines have proven their worth over the last almost 4 decades. In fact, the oldest 48 turbines keep going strong from the late 1970s despite having a combined capacity of only 2 megawatts. Compare that to the standard Vestas V164 turbine introduced in 2013 with a capacity of 7 — 9 megawatts (MW). That’s a 200-fold improvement! This means old turbines are about to be decommissioned in even larger numbers. In 2017, a total of 220 turbines were connected to the grid with a total capacity of 373 MW, while a total 174 turbines with a total capacity of 98 MW were decommissioned. That’s a net addition of 46 turbines on land and at sea representing a net addition of 275 MW. That’s an average of 6 MW per turbine! That is astonishing compared to the pioneers of the 1970s putting up dozens of 25 kW turbines to begin with. At the end of 2017, Denmark had a total of 6,157 turbines in action with a total capacity of 5.5 GW and they generated a total of 14,772 GWh of electricity in 2017. Now, let’s assume the average of 6 MW per turbine holds for some time, that would mean a total of 917 turbines would suffice to preserve 5.5 GW of capacity. It is assumed that 10 GW of total capacity will be the goal in the country, which means some 2,000 turbines is enough, or one-third of today’s number. Indeed, with fewer and more efficient turbines, it’s easier to place them where the wind is strongest, and thus keeping them further away from residential areas. The never-ending quarrels about turbines destroying the scenery and creating low-frequency noise will diminish. A total of 9,387 turbines have been commissioned in the country since 1977, of which 3,230 have since been decommissioned. Of the current 6,157 turbines, 5,649 are on land and 508 are at sea, which translates to an 8.6% share of turbines at sea. However, the capacity share at sea is 23.6%. The very first wind energy farm at sea went online in 1991 with 11 turbines each rated at 500 kW, and it was dismantled just last year after 26 years of service. 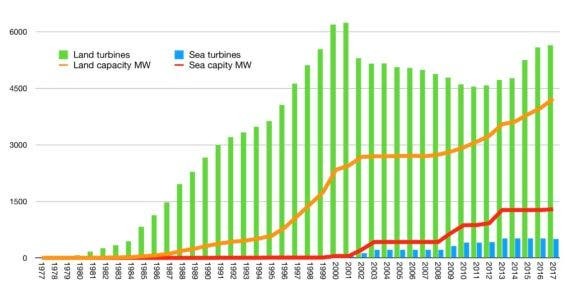 It is important to note that the very first turbines built for use at sea were 20-fold more powerful than the first turbines built for use on land in 1977. How the wind energy market share will cope with the fact that solar has an even greater potential in price drops time will tell. I for one will be very careful predicting this, like I did in my last piece on the subject. But for now, the potential of wind ensuring the goal of a 100% fossil fuel-free energy infrastructure in windy countries like Denmark is unchallenged.